This simple guide will help you understand when your fish is done cooking and ready to eat. Generally, most fish take little time to cook, so you can count on a quick preparation. Therefore, it's crucial to get it right by recognizing when the fish has finished cooking. Fish meat is fragile, the muscle fibers are short, and the fat content is low. So it can be easy to overcook it. Fish flesh is transparent before it's cooked. You want to cook your fish just until it turns opaque, or milky-white, all the way through. 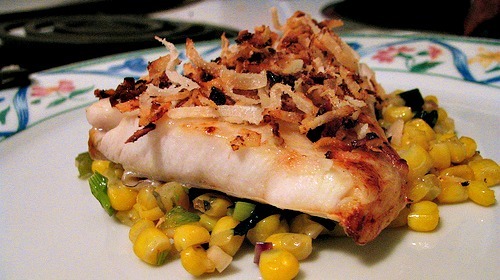 Perfectly Cooked Fish Fillet - Coconut Topped Fish with Corn Salsa. Sometimes it's best to slightly under cook it. It will still continue cooking with its retained heat, even after it has been removed from the heat source. Overcooking will draw out its moisture and tenderness, and the texture will toughen or fall apart. You can check your fish by making a small incision into the flesh with a knife. Again, you're looking for it to be opaque in color and flaky throughout the meat. Another method can be by touching it with the tip of your finger. It should be about same firmness as the tip if your nose. This becomes easier to judge with the more experience you gain with cooking fish. A skewer can be used to test as well. A wooden, bamboo, or metal skewer will all work. Stick the skewer into the thickest part of the fish. The flesh should flake easily and separate from the bones. And the skewer should be able to slip in and out with little resistance. An instant-read thermometer is a fool-proof method used to test for doneness. Insert the thermometer into the thickest part of the fish, away from the backbone. The ideal range is between 125°F to 140°F. It's best to pull the fish away from the heat source by the time its internal temperature reaches 135°. This should ensure that it wont overcook by exceeding 145° as it continues cooking using its retained heat. A widely quoted rule of thumb is the 10 minute rule. This means that a fish takes about 10 minutes to cook per 1 inch of thickness, measuring the fish at its thickest point. Add about five minutes when cooking fish in a sauce, in parchment paper, or in aluminum foil. For poaching, the ten minutes begins when the water begins to boil. When using a stuffing in a fish, measure the thickness with the stuffing in it.